In one of the great panders of the 21st century, Republicans have been grousing about the 47% of U.S. households that paid no federal income tax. They argue these mostly middle class families are not paying their fair share. Making these slackers contribute something to government revenues would make a big dent in the deficit, they say. They also continue to harp on their timeworn meme of high corporate taxes putting American business at a competitive disadvantage in the global economy. In a demonstration of Panderbear's principle that one chart is worth a thousand panders the following graphic puts the lie to both aforementioned panders. It displays the percent of government receipts coming from the three main sources - individual income taxes, corporate income taxes, and payroll taxes. The data presented comes from the Budget of the United States Government: Historical Tables Fiscal Year 2008 Section II Table 2.2. The chart includes data from 1947 on. Why 1947? Because that's the year Panderbear was born. That's right, Panderbear is a Baby Boomer. Over these six decades three trends are apparent: individual income taxes as a percent of government revenues have remained stable at 40-50%; corporate income taxes have represented an ever shrinking fraction of receipts; payroll taxes as a percent of revenues have grown enormously. The Republican pander conveniently ignores all of these facts. This one chart demolishes both "The 47% Solution" (tax the middle class more) and the "corporate taxes are too high" narrative. 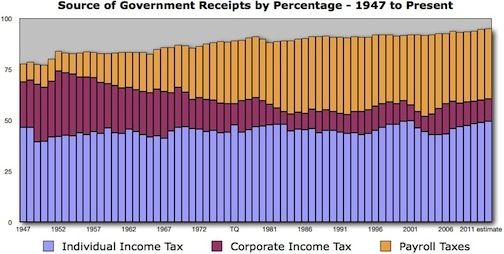 Regardless of the nominal income tax rates on individuals and corporations, the historical trends in actual government receipts shows the middle class picking up the tab for the real slackers, tax dodging corporations.